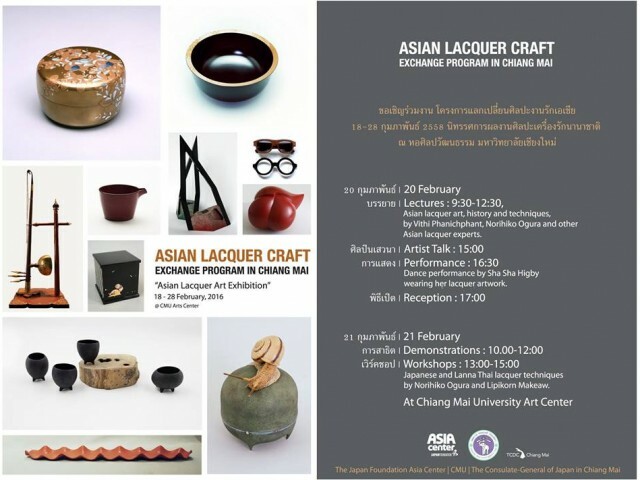 Asian Lacquer Art Exhibition will be held at Chiang Mai University Art Center from 18th to 28th February 2016. Lacquer art works from Thailand, Japan, Cambodia, China, Myanmar Taiwan, Vietnam and U.S.A over 50 lacquer works will be exhibited. I will make presentation titled ” The Influence of Japanese Lacquer Craft on European Imitation Lacquer” in the morning 20th Feb at Auditorium. Professor Ogura of Tokyo University of the Arts and other lacquer artist will demonstrate the workshop of raden(mother-of-pearl) and makie. Every one will be highly welcome!! !